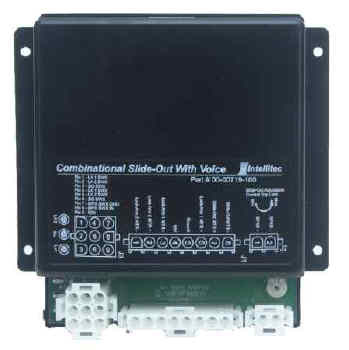 The Combination Slide-out Controller with Voice functions as three controllers. It independently controls two lock arm motors and a slide-out motor. The controller depends on several inputs: Lock Arm 1 Switch, Lock Arm 2 Switch, Slide-out Switch, MPX Switch, and an Ignition Input Signal, which is used to lock out control module. The MPX Switch is a momentary rocker switch used to allow the user to select a run/stop mode of the Controller. Three LED’s are supplied for indication of three input switches. When a run condition exists, the LED’s will indicate the position of the selected switch. The LA 1 LED will be ON if lock arm 1 is in the unlock position (closed switch). The LA 2 LED will be ON if lock arm 2 is in the unlock position (closed switch). The slide-out LED will be ON if Slide-out is flush with the RV (closed switch). The indicating LED’s will turn OFF when the following conditions have been satisfied: the Controller is in a stop mode and no motor is energized.